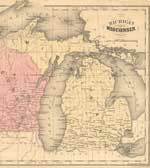 1855 Map of Michigan & part of Wisconsin – Fun Stuff for Genealogists, Inc. This is a full color reproduction of an 1855 map of Michigan with parts of Wisconsin. Note: What appear to be roads are railroads. All of our maps come in a protective, archivally safe sleeve. Measurements: 11-1/2" tall x 10-1/2" wide. Sorry, maps are not returnable. Sorry, maps are not returnable.